A patent application filed on October 23rd that surfaced over at NeoGAF reveals that talk of Sony creating a break-apart controller that surfaced back in July of this year might not have been as far-fetched as was originally thought. 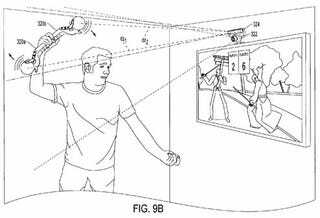 The patent is for a method by which a system could track the movement of one or more controllers, with video tracking the position of the controllers and ultrasonic frequencies used to determine their distance from the console. What this means is that two different controllers would submit data to a video input device like the PlayStation Eye, with the Eye's microphone picking up on both the visual location and aural distance to track motion. The patent application is chock full of images showing a controller with a sphere on the end that would contain a retro-reflective area, it's own light source, and would change color to assist in capturing image data. Furthermore, the patent shows two of said controllers connecting not only side-so-side, but end to end, creating a sort of giant bow-and-arrow looking device. Hit the jump for more images from the patent application.